Through more than 6 years’ efforts, ToKnow medical research department has successfully run dozens of programs in the prescription medicine consultation field, accumulating quite rich experience for clients’ to provide professional market analysis. Combining the life cycle of medical products, medical product researches provided by the ToKnow medical research department are divided into three parts: ‘research and development of new products’, ’before the launch of the product’ and ‘sales after the launch of the product’. 1.In the researches of new product R&D, we help clients to know the need of consumers and doctors, to provide the customers with scientific basis of developing new products and improving the existing products, thus, enhance competitiveness of the products. Medical products are characterized with strong functionality, which means the efficacy of the products is the foundation and core. The initial problem enterprises should concern when developing new products is how to develop products that meet the market need and to better meet the needs of the consumers and treatment needs of doctors. Through long-term accumulated experience, ToKnow medical research department has established particular medical treatment innovation research model, which can help clients to know the needs of customers and important needs of doctors that hasn’t been satisfied, to dig opportunities in market; and at the same time, to forecast market size, to know about the future market potential of products, evaluate risks in the future, and to provide decision reference for development of products. 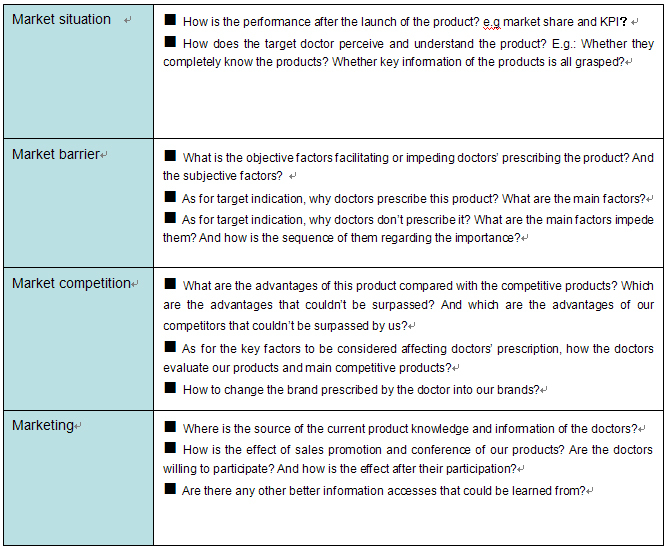 2.In the researches before the launch of the product, from the perspective of product sales, ToKnow medical research department starts from scanning of target market (doctors & patients) and market evaluation, and finally form the product positioning and product key information confirmation by market segmentation research. 3.In the researches after the launch of the products, main research models of ToKnow medical research department include tracking study after the launch of the products, marketing effect study, brand tracking study, and the consumer insight study on the need of prescription changing into nonprescription.